This entry was posted in Southern Political Issues and tagged government, politics, race, Trayvon Martin. Bookmark the permalink. Those poor maligned minorities will never, ever see themselves as actors in their own destiny. Just won’t happen. 500 years from now they will still be blaming other parties for their own problems. Wyandotte, I’m afraid that you’re right. I see an occasional glimmer of hope when I see Black men who have turned away from that victim mentality and taken responsibility for their lives and for their families. There are several Black families in our church, and they are all living proof that race is not a barrier to being responsible, successful, and decent civilized men and women. They, however, are on the edge of the bell curve. I see them as my true brothers and sisters in Christ, but they are probably rejected by most of their own race rather than being looked up to and seen as good role models. I am convinced that there is simply no way for the different races in large numbers to peacefully coexist. I have no solution to offer – just a sad dose of reality. I wonder whether your analysis is correct here, Mr. McGehee. I am not so certain that the problem is race so much as a large number of people being led astray by leaders who get them to see themselves as victims, perennial victims of an unjust society. The problem seems to be more that leaders in the black communities find it easier to argue that their constituents get benefits than help in finding work. This is similar to what has happened to the Palestinians in the Middle East, who were promised that they would only be refugees for a short while until the Arab nations had removed Israel from the map in 1948. We also have similar situations here in the UK where folks who live on benefits have little in common with the working population, and one party is trying to paint the government as hard-hearted for restricting benefits to not more than GBPounds 500 per week (about US$750), equivalent to the before tax average earnings. The main problem in all these situations is that it always causes an outcry when a benefit is stopped, but much less of an outcry when taxes have to be raised to pay for it. During my education, we visited a court to hear part of a case on one occasion, and then reviewed the newspaper reports of the case. It seemed to me that I had been in a different courtroom from the newspaper reporter. Following the George Zimmerman case from Britain, I was surprised to find a racial description I had never heard of before: white Hispanic. Surely Mr. Zimmerman is either white or he is Hispanic. He cannot be both. This suggests to me that some at least in the mainstream media were trying to put more of a racial slant on this case than there was in reality. 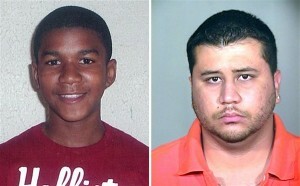 This was compounded by the use of photographs of Mr. Zimmerman in which his skin appeared to be lighter in colour than it actually is, and by photographs of Trayvon Martin which were several years old and encourage everyone to think of him as a child rather than the large young man that he was. One point that I have only discovered after the trial was that the skittles sweets and the Arizona Watermelon Fruit Juice cocktail can be used in conjunction with a medicine to make a ‘legal high’ type of drug, and that the autopsy on Trayvon Martin’s body showed that his liver had signs of abuse of this drug or its precursors. It makes one wonder whether he was on his way to somewhere where he could concoct this ‘legal high’ rather than innocently walking to his father’s home. Fred, I can’t disagree with anything you’ve said here. It’s really the age-old problem of people following those who make promises that cannot be kept. They have found a group of people (Blacks) who act as a single group and are easily swayed by emotion rather than fact. For much of our history, America has been rich enough to push a large amount of tax dollars and preferential legislation their way because it was easier and cheaper than actually addressing the problems head-on. America has changed, and that is no longer the case, so the “leaders” are now scrambling to find ways to maintain their power. Claiming “racism” for every problem with Black society is their reaction to those changes. RE: the “legal high” from the Arizona Watermelon Fruit Juice (the media changed it to “iced tea” to avoid the racial stereotype jokes) – I read about that only AFTER the trial concluded. It is easy to just point the finger at Blacks for their problems – and they as a race clearly bear the largest portion of blame – but I am certain that the situation would have been much better had the politicians and the media and the Marxists not taken advantage of the situation and deprived Blacks of the need for accepting full responsibility for their own actions.